Trevi DOP Extra Virgin Olive Oil - a fresh, fruity, green Umbrian olive oil with aromas of fresh olives, & hints of green apple, Umbrian truffle, & overtones of honey. Trevi olive oil is smooth on the palate with a slight peppery finish. The olive oil has been produced on the Trevi hillsides for 2000 years, using techniques that are not much different from those used by the Etruscans at that time. The olives are hand-picked in the field & carried the same day over rough terrain to the mill. The olives are crushed by two granite stones & the oil is then separated with a Sinolea machine without pressure. DOP means Denomination of Protected Origin & only a handful of Italian oils can boast this distinction. 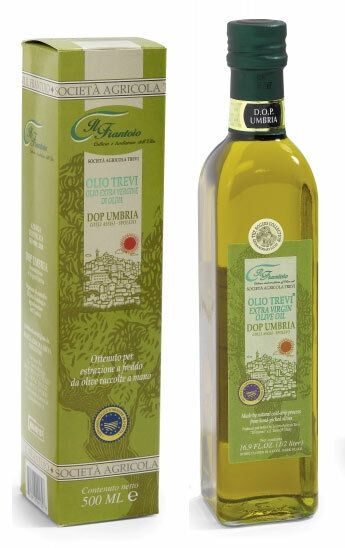 Trevi DOP Extra Virgin Olive Oil (Umbria).